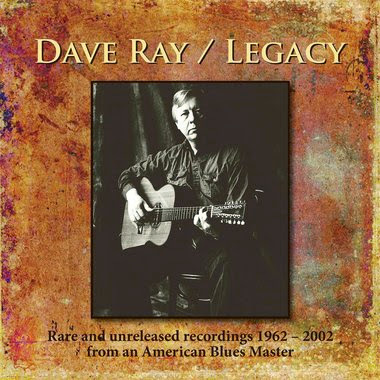 I just received the newest release (October 28, 2014) Legacy, from Dave Ray and I have to say the intensity of these recordings is staggering. I've been listening to the raw blues since I was a kid and am really only familiar with Ray's work in passing. This is a 3 disc collection of blues tunes with roots in the 20's, 30's and 40's which for the most part has never been widely available. Disc one is primarily solo work, recorded between 1962 and 1987. 16 tracks beginning with Leroy Carr's Alabama Women and you would swear that this is a clean recording of an original artist from the time. Excellent! Included on this disc are a number of tracks written by Ledbelly, Brownie McGhee, Skip James, Sleepy John, Muddy, Blind Blake, originals by Ray and concluding with an incredible version of Fenton Robinson's Loan Me A Dime. Outstanding! The second disc covers 1988 to 1994 and the Ray and Tony Glover Years. 21 tracks on this disc are a little more polished but retain that raw energy. Covering Jimmy Rogers, Muddy, Memphis Minnie, Robert Petway, Tommy Johnson, Blind Willie McTell, Memphis Slim and Mississippi Fred these tracks are real and raw. Excellent! Just listen to the second track on this disc, Muddy Water's Long Distance Call and you hear a pure artist, doing another artist's track and making it sound original and vibrant! Blind Willie McTell's Statesboro Blues has a life of it's own with real blues syncopation... not modern timing. Very very nice! Disc 3 has a cleaner more modern recording sound but the blues is still raw and real. These 18 tracks were recorded between 1995 and Rays death in 2002. Opening with Tommy McClennan's Shake 'em On Down , Ray has you in the palm of his hand. Beautiful harp trimming on top of a rhythmic guitar with true blues vocals. Super! The countryified Coal Man, written by Peg Leg Howell has real life. Percy Mayfield's My Mind Is Trying To Leave Me is excellent! Further tracks by Big Joe Williams, Bill Monroe, Percy Sledge, Joe Callicott, Blind Blake, Bobby Womack, Big Bill Broonzy, and the great Arthur Crudup make this one of the absolute best "modern roots of blues" releases that I may have ever heard. Ray on 6 and 12 string acoustic and electric guitars and vocals accompanied by really hot harp work by Tony Glover. There is a terrific 32 page booklet with insight into the Ray's life and recordings, photos, track listing and commentary. This is one of the true raw early style blue gems that I have had the privilege to review since starting my report a number of years back. This is an excellent collection and I highly recommend it.